Known as Roquette in France, Arugula in many countries and simply Salad Rocket in others this is an easy to grow plant in the garden or container. Well grown, early picked Salad Rocket will be sweet, nutty with a slight peppery taste, the older larger leaves can be bitter and overly peppery. Generally the best time to plant Rocket is from March through to November. Avoid the depths of winter in colder zones, and the heat of summer in all zones. Rocket tends to ‘bolt’, or go to seed in hot dry weather. You can plant Rocket year round depending on variety and climate. In the garden dig in lots of well rotted compost and some aged cow manure, rake through well and sow seeds directly. In cold weather try a little plastic igloo to speed up germination. In a container, use a high quality potting mix with water retaining crystals mixed in, water regularly with a weak liquid seaweed fertiliser for great results. You can grow it from seeds, or small seedlings or plug plants. The seeds are very small and should be spread on the surface of a finely tilled soil. Cover them with a fine layer of of sifted soil or vermiculate. The seeds will germinate in 7 days or so and can then be thinned as desired. Mulch around the plants to maintain moisture in the soil at all times. If the plants BOLT and start to flower the leaves become bitter. You can cut the plants back to encourage a new growth. Water regularly with a liquid seaweed fertiliser and add a little lime to the soil, as rocket does like a sweet soil. Eruca sativa Apollo – Trust the Dutch to come up with an improved strain, this Apollo Arugula, or Rocket. It is not a bitter as normal varieties, the leaves are larger and more round and it can be harvested up to 5 times before you need to replant. From sowing seed to producing a full crop will take around 6 – 7 weeks. It is grown in the same way as other types. Eruca sativa Sylvetta – Another variety to consider is Sylvetta also known as wild rocket, it is slower growing however it has a stronger taste. This is is slower growing, about half the height, and has yellow flowers. The leaves are also more deeply lobed with a more pungent flavor. How can you tell the difference ? This variety has yellow flowers, normal Arugula has white flowers. This one also will tend to self seed more readily. Plant rows sequentially ( every 2-3 weeks) to ensure continued supply. 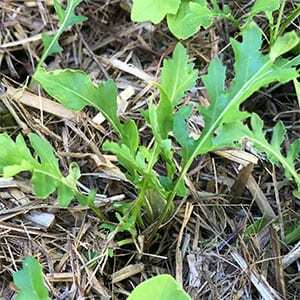 Arugula or Rocket tends to ‘bolt’ or go to seed if it dries out or gets to hot so a little shade will help prolong the season. Picking or Harvesting Salad Rocket. Pick often, try not to let the leaves get to big as they get a little tough and bitter. Remove any yellow leaves and dispose of them.